Terry Saunders now has LED rear lights for your MG Y in POSITIVE GROUND back in stock! These can be ordered from him on his page. Today, please welcome John Tudgay with Y 6805 to Ys on Parade. Norbert Lange has also added some pictures of his Grandchildren and his Y to our "Y"oungsters page. Also, a great video of the restoration of Dave Edwards' Y Type was found over the weekend on the Internet. This has now been added to our page of Ys on Film and other media. The International MG Y Type Register is pleased to announce that, in conjunction with John James' TTypes.org, it has &apos;teamed up&apos; with Travel Destinations (ABTA Registered) and negotiated preferential travel rates for International MG Y Type Register members. If you are planning to travel to or from Mainland Europe (including Spain) using P&O, the Channel Tunnel or Brittany Ferries (including Spain) then please contact Travel Destinations on +44 (0) 1707 329988 and be certain to mention that you are a member of the International MG Y Type Register to obtain your Preferential Rates. These are not only available to you when you are in your MG Y Type, but when travelling in any MG or indeed your normal daily use car. David Pelham, our Public Relations Officer said "Travel Destinations were able to assist with the passage of our cars to/from Brittany on the forthcoming Tour in September 2012. I was pleasantly surprised that my fellow participants and I saved almost 30% by booking through Travel Destinations. The saving that we achieved is equivalent to more than a tank full of petrol for each of the participants." The arrangements will not only benefit International MG Y Type Register members in the UK but also in France, Holland, Germany, Switzerland, etc travelling to the UK. Paul Barrow, our Webmaster and Registrar said: "The International MG Y Type Register derive no benefit from this arrangement other than the satisfaction of knowing we have been able to secure a benefit for members. This benefit is available to you with zero Membership Subscription or Fees reflecting our true 'Run by Enthusiasts for Enthusiasts' approach, which cannot be matched by those clubs specifically catering for our cars and making similar claims." The English version of the Reprinted Article from the Swiss publication SignPost featuring David Pelham's YT has now been added. An entry form has been added for entry to the MG Car Club Spring Run and can be downloaded from the Events page. Jerry Birkbeck has sent in a flyer for the Abingdon Anniversary on March 25. Mel Fry has updated his picture of Y 5103 in Ys on Parade. Today please welcome Neil Coombes as the owner of Y 7036, Y/T 2701, and YB 0453 to Ys on Parade. For those who are into using sheet metal, a conversion table has been added to the Technical Data, Size Matters section to enable you to convert between SWG (Standard Wire Gauge) to Inches to Millimetres. Butch Taras (Y 6757) has joined the Vendors offering services to owners of MG Ys worldwide. Butch bring a host of skills and products to us and does quality work so please use him for your needs and check out his page! 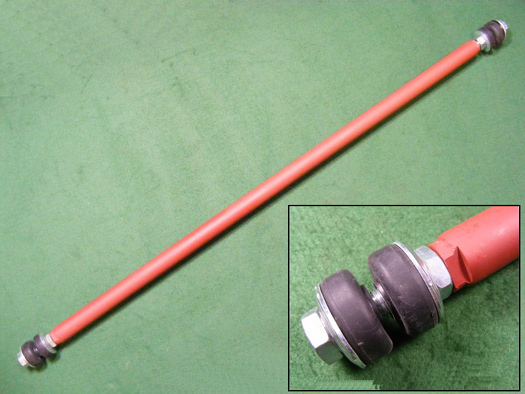 Panhard rod assembly as original for MG YA & YT. Can also be fitted to YB if suitable brackets are fabricated (brackets not available from us). The MG Car Club has kindly provided a copy of their recent article "Out of my Comfort Zone" from their February 2012 issue of Safety Fast too - thank you. Please welcome Zihao Wong and his family and their Y 5717 to Ys on Parade. Zihao also brings a new country to the International MG Y Type Register so we also welcome Singapore too! Two new parts drawings are available now, for the Battery Box lid (courtesy of Michael Long, UK) and for the Rear Side Curtain Frames for the MG YT (courtesy of Jim Spears, USA). This month's Picture of the Month comes from Zihoa Wong, from Singapore. The Reprinted Article this month comes to us from the Swiss publication SignPost and features David Pelham's YT - another truly International article! The English translation will be published in the middle of this month. David Pelham has informed us that all 12 places on the &apos;Y Type Tour of Brittany&apos;(see 4 February 2012 news)are now taken and he is regretfully unable to accept any more entries. He is operating a short "reserve" list in the unlikely instance of any of the current entrants falling out and applications for joining this list should be made by email to David Pelham as soon as possible.